It’s Shark Week, but the most dangerous predators this year aren’t on TV or at the beaches – they are in Washington D.C., where they are menacing families with the help of their chums in Congress. 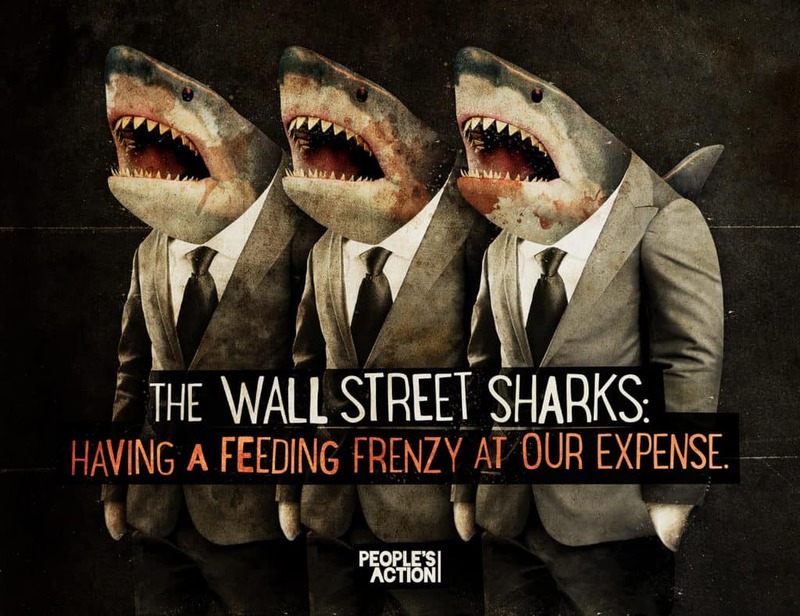 From payday loan sharks to Wall Street bottom-feeders, financial predators of all shapes and sizes are descending on our capital to take a bite out of financial protections. Over the past six months, we’ve seen these sharks swarm in a feeding frenzy on our rights. GOP-backed Trumpcare wants to destroy Medicare and Medicaid, and take health care away from millions of Americans. The Trump administration’s proposed budget slashes funds for public housing, food assistance and protecting the environment. Newly appointed Education Secretary Betsy DeVos is refusing to to forgive loans to students defrauded by for-profit colleges, while seeking to funnel millions of dollars into for-profit charter schools. On issue after issue, the GOP, the president and his team prioritize corporate tax breaks and tax cuts for the wealthiest one percent. In their latest attack on everyday people, Trump’s corporate sharks have set their sights on our financial system’s lifeguard: the Consumer Financial Protection Bureau (CFPB). After Wall Street speculation nearly sank our economy in 2008, Congress created the CFPB to stand up for consumers and give them a voice – and some equal footing – in dealing with banks and lenders. The CFPB is a lifeguard for families making financial decisions. The CFPB is there when a shark gets us in their jaws through trickery or fraud – coming to the rescue and a chance for justice. It was the CFPB that uncovered Wells Fargo’s massive effort to defraud consumers by opening fake accounts. Since it began, the CFPB has returned $11.8 billion to more than 29 million consumers defrauded by big banks and financial companies. The CFPB rescues shark-attack victims; they issue rules that protect consumers from unfair and deceptive practices. Rules created by the bureau have prevented foreclosures, reduced racial discrimination in auto lending and stopped abusive debt collection practices. 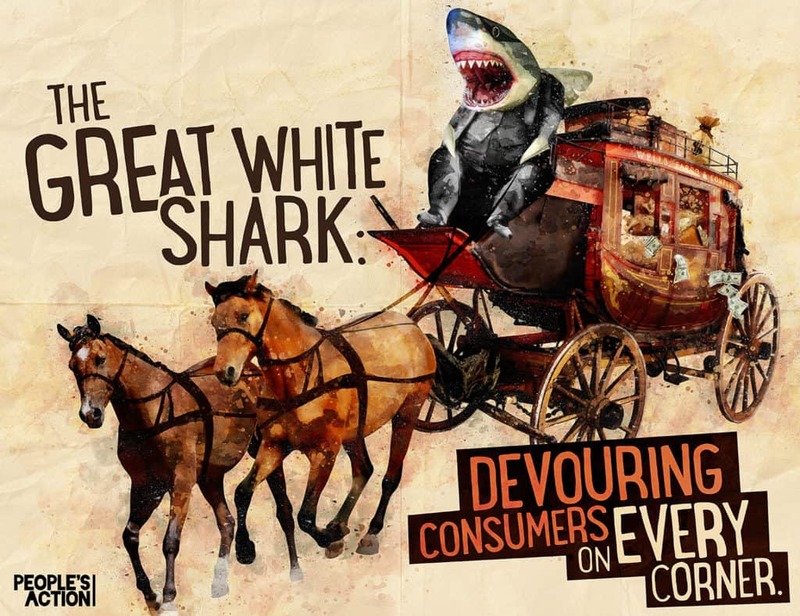 Last year, the CFPB began working on a rule to rein in the worst abuses of the payday loan sharks, an industry that traps more than 12 million Americans in a cycle of debt and desperation every year and strips billions of dollars from local communities. People’s Action members submitted more than 100,000 comments in support of a strong rule to the CFPB. Last week, the CFPB issued a rule that would stop banks and credit card companies from forcing consumers into arbitration, a process rigged in favor of the big banks. Just hours after the CFPB issued its arbitration rule to ensure that consumers who are wronged can go to court to get justice, top Senate Republicans announced an effort to kill the rule. In May, Texas Representative Jeb Hensarling, chair of the House Financial Services Committee, introduced the CHOICE Act, a Wall Street dream-come-true. The CHOICE Act would eliminate the CFPB’s ability to examine banks, credit reporting agencies, debt collectors and lenders to ensure they are following the law. CHOICE would stop the CFPB’s rule on payday lending before it’s even issued. It would repeal the requirement that investment advisers act in the best interest of their clients, and allow banks to charge more for debit cards. The same sharks that caused a worldwide financial crisis are circling again. They are determined to dismantle as many regulations and protections as they can. They think they can take the lifeguard off the beach and go back to soaking working families. Consumer advocates, faith leaders and everyday people are standing up and pushing back. We are demanding that our government stand up for families and our financial future. We are putting the Wall Street sharks on notice: This Shark Week, we are biting back. Will the Senate Sell Our Future for Campaign Dollars? My voice catches in my throat when I think about telling my own story of sexual assault. I know the courage it takes for Dr. Blasey Ford to speak. But I know that I, and millions like me, have absolutely no intention of letting her speak alone. Jessica Juarez Scruggs is deputy director of policy for People’s Action.